Facts and information about the History of Clothing and regalia of Native American Indians and the meanings of Headdress Feathers. Native American Indians are famous for their many different styles of headdresses and War Bonnets but few people are aware of the significance and meanings of the types and cuts of feathers that were included in a particular headdress. 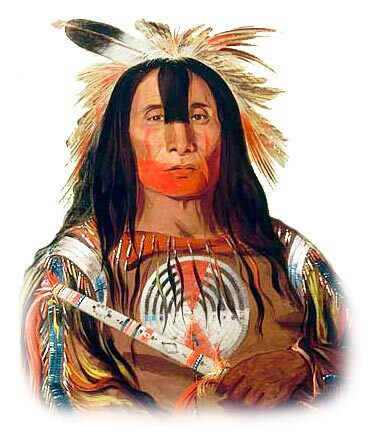 A feather that was cut in a certain way, notched, split or dyed red conveyed the history and exploits of the wearer that was immediately recognised by other Native Indians. Warriors were awarded feathers as the tribe's acknowledgment of acts of bravery and war honors. Headdress Feathers Fact 1: A feather with a tuft of horsehair attached indicated the warrior's first coup. One of the greatest honors bestowed upon a warrior was called a 'coup'. This achievement meant that the brave had got close enough to his enemy to touch him and then return to safety - refer to Counting Coup.